I always hear about aliasing and anti-aliasing and I know what it looks like but what I don't understand is what causes it. Is it a physical phenomenon? Or a numerical one? If it helps to explain, I have some programming knowledge, but not in video games or graphics. Is it a physical phenomena ? or numerical ? This question sorta implies to me that you don't actually know what aliasing/anti-aliasing means. I mean, you say you "know what it looks like" but if you actually knew what the terms mean, you'd probably realize your question is nonsensical. Aliasing is a side-effect of how computer graphics are rendered, and computer graphics are pretty much by definition not physical phenomena. This is an issue whenever you render the pixels in an image, whether you're drawing freehand or are writing an algorithm to calculate the pixels for a 3D polygon. It's just a side-effect of the fact that the image is a square grid of pixels. "Anti-aliasing" is when you disguise the stair-step look by blending the colors together along the edge pixels. The accepted answer is not strictly correct, although it addresses the most common usage in computer graphics. Aliasing is a fundamental concept in signal processing and the mathematical theory of it predates computer displays. It is also not really true that "it is a side effect of the fact that pixels are square". Aliasing exists any time you discretely sample a signal at a rate below the Nyquist rate for that signal and affects digital audio as well as images and many other types of discretely sampled signals. Aliasing in computer graphics is a side effect of discrete sampling, not of the shape of the pixels. Anti-aliasing in computer graphics is a deep and complex topic and there's a lot more to it than just edge anti-aliasing. Again, there's a lot of underlying theory from signal processing and it's an active area of research in computer graphics how to anti-alias effectively, not just for edges but also for temporal aliasing, for aliasing when reconstructing a BRDF in pixel shaders, for shadow edges and in many other areas. Mip-mapping of textures in 3D graphics is a well established anti-aliasing technique that is addressing an important problem other than edge anti-aliasing for example. It's really a mathematical phenomenon more than a physical one but it shows up in engineering in many areas other than computer graphics. I wouldn't really describe it as a numerical phenomenon either - it's a result of discrete sampling, not of the discrete representation of numerical values on a computer, although that can cause aliasing effects too. Understanding the fundamentals of signal processing is a good foundation for understanding how aliasing manifests in computer graphics and for understanding how to go about reducing it. Adding to the other two answers, here is a more intuitive explanation of what happens. The grid squares represent pixels. The red polygon on the left is the shape being drawn, represented internally as a sequence of points. When it is rendered, it is converted from a list of points to a buffer of pixel colors. The discrete sampling determines which pixels are dark and which pixels are light, based on how much of the polygon covers each pixel. To answer your question, this is a numerical/mathematical phenomenon because information about the original shape is lost due to approximation. 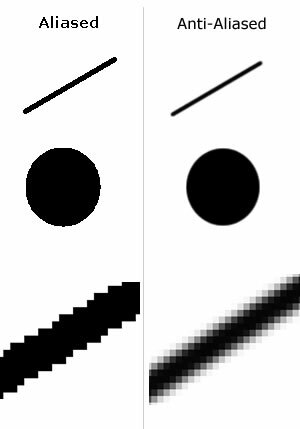 Anti-aliasing is when the rendering attempts to correct for aliasing by making partially-covered pixels less intense. In signal processing field, aliasing refer to the misidentification of signal frequency. For example, due to the lack of the adequate consideration in under-sampling step it may lead to the generating errors and distortion. It can be generalized to the 2D discrete signal such as an image. Not the answer you're looking for? Browse other questions tagged rendering antialiasing or ask your own question. What exactly causes a surface to overlap another? Anti Aliasing: How to implement supersampling in OpenGL? Why is anti-aliasing so slow? How do I set which side of a mesh is visible? Is UI anti-aliasing broken in Unity 5.6?